Anyone got Eugano AES stallion (Lugano Van La Roche) Offspring?? Although Eugano was sadly PTS a couple of years ago after breaking his leg, I have one of his last foals, who is an absolute sweetie! Just wondering if she has any relatives out there? Eugano was an Anglo European Studbook stallion, by Lugano Van La Roche. He stood in Yorkshire, and later in Kent. I'm sure he has sired some pretty nice sports horses, and thought I'd see if I could find any of them!! I'll put up some pics of Kim, who was out of my ISH mare. PM me if you like, I used to look after him at Carlton Bank Stud and have bred quite a few by him. I can let you know about many of his foals including a brood mare I have by him. I wondered what had happened to him. Sad that he broke his leg. He must have been quite an age by then. He was a lovely horse and had some very good stock. An old trainer of mine nr Durham has a gelding by him. He must be around 21yo now and still gets ridden regularly, although his competition career was cut short around Medium level due to a pelvic injury. 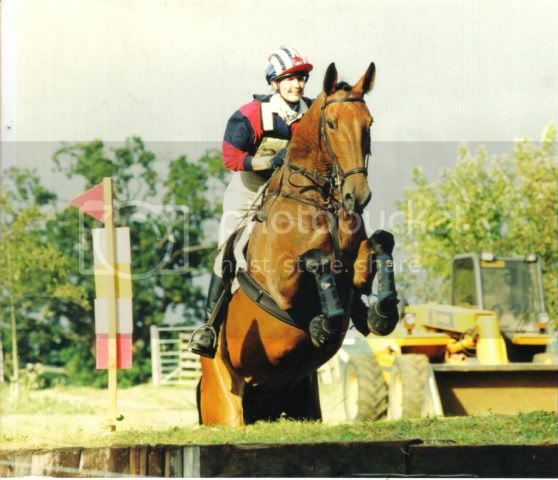 mine was a huge bay gelding (as in, 18hh ish) with oodles of scope, very sweet temperament, and a lot of spookyness. unfortunately he broke down before i could do more than novice event him, but he always felt as if he could have jumped a house... in fact, he's the only horse i've ever sat on that i think i could have ridden down to a puissance wall on. my lad's with a friend now, as a hack/dressage horse. Wow, this is all very interesting! I'm just backing Kim at the moment - she's very sweet, oodles of scope too, but barely made 15.1 out of a 16.1 mare! She has quite a strong "no, I don't feel like doing that thanks!" streak in her though! Nothing scares her. Would love some pics if anyone has any. I think Eugano made it to 25/26ish when he was pts, had an accident in the field but had still been covering mares up to that point!! probably just about the best i've ever sat on, tbh. Yes, it's Moose. He BE evented under the name "XL". Such a super gent of a horse. I must take some pics of her, you might see what I mean! Anyone else with photos of this family, I'd be really interested - I think its a super bloodline. The more I do with Kim, the more I adore her - she's so smart and sensitive, and somehow her paces have more elevation and wow factor than my big dozy Rhinelander!! Hi just found this thread! I have a 6yo gelding by Eugano and he is simply FAB! He is bay,15.3hh and oozes character. Just started competing in dressage competitions and definately living up to expectations. Hi found you guys while looking into my horses breeding, I too have a 3 year old by Eugano x cruise missile, sweet bright bay standing at 15.3 with great movement, however talent not established yet but due to break in spring time. I know nothing of the breed so any info would be useful thanks! i have a 5 year old by eugano.was sad when i heard he broke his leg.would like to no of his other offspring and what they are doing now. thanks. just to see what his other off spring are doing my gelding is a black 16 2 he has been cheeky from day 1 has a very good temperment we are starting to do some dreasage now but he can be a bit cheeky be nice to see some pics of others. Hi, Sorry to hear that Eugano is no longer with us, we did not know this. We have a 12 year old mare (Pallygano) by Eugano and and also a 4 yr old grandaughter (Elgano). We can be contacted on 07976401629. We are in Leicestershire. Regards, Grahame and Beverley.